The following table gives information and links for water quality rules which are currently under revision. The official publication for announcing such changes is the Utah State Bulletin, published on the 1st and 15th of each month by the Division of Administrative Rules (DAR) and available on their Website. The Subject is linked to the DAR Form and the proposed text. (Amendment) Section R317-1-3. Requirements for Waste Discharges. New technology-based limits for controlling nutrient pollution. (Amendment) Numeric Criteria, Standards of Quality for Waters of the State, R317-2-14. Filed Change in Proposed Rule to become effective July 2, 2014. (Amendment) Environmental Quality, Water Quality, R317-11. (Amendment) Environmental Quality, Water Quality, R317-2. Standards of Quality for Waters of the State. A summary of proposed changes and rationale is available here. Additional supporting information discussed at the 10/29/2009 Water Quality Standards Workgroup Meeting is available here. 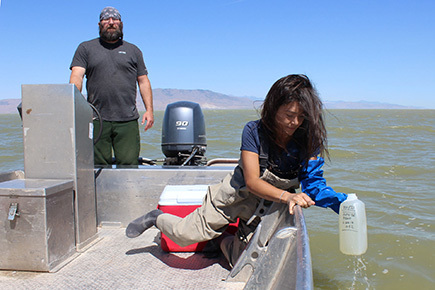 Draft Report: Development of an Assessment Framework for the Impounded Wetlands of Great Salt Lake.